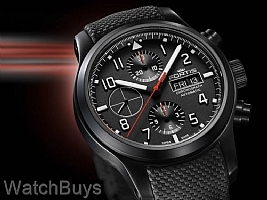 Fortis adds a brand new watch to its popular Aeromaster Collection of pilot's watches. The new Fortis Aviatis Aeromaster Professional Chronograph features a black PVD case and integrated performance strap with the clean dial layout that is a hallmark of this series. Large pushers drive the chronograph function, complete with a central chronograph hand, a thirty minute elapsed counter at 12 and a twelve hour elapsed counter at 6. The commanding presence of this watch comes from a combination of size and legibility as the 42 mm black PVD case and integrated black PVD bracelet design make the Fortis Aviatis Aeromaster Professional Chronograph ideal for everyday wear. In fact, the 42 mm case diameter is not a coincidence as this new model is based upon the design of the legendary Fortis B-42 model. As a result, the DNA of the Aeromaster is shared with the Flieger and Flieger Professional models and connects directly with Fortis' storied history in the aviation industry. This watch is fitted with a black integrated Fortis performance strap meaning that there is no gap between the strap and the case edge.